New variety to the UK thanks to some fantastic hybridising at one of Holland's leading cut flower Alstroemeria breeders. It combines the impressive high flower count needed for commercial growers, with a strong and robust garden habit, being just 60cm (2ft) tall, and forming big perennial clumps. Lovely and unique strong bronze purple tinge to the foliage. They keep flowering all summer and are naturally hardy to about -7C. Supplied as a extra large jumbo plugs, from tissue culture, and over-wintered, to plant straight out or into pots, for flowers in first summer and every summer after too! Thanks to some fantastic hybridising at one of Holland's leading cut flower Alstroemeria breeders, we are delighted to offer this amazing variety to UK gardeners. It combines the impressive high flower count needed for commercial growers, with a strong and robust garden habit, being just 60cm (2ft) tall, and forming big perennial clumps. 'Summer Breeze' has a lovely unique strong bronze purple tinge to the foliage which sets off the gorgeous flame coloured flowers to a tee! The good news is you can enjoy this impressive floral display for even longer as they just keep flowering all Summer, new buds emerging all the time well into Autumn. They're perfect for long lasting displays in pots or mixed borders. Naturally hardy to about -7C, they will survive most UK winters in well drained spots, and emerge bigger and bolder year after year. Very easy and low maintenance - just beware slugs on new Spring growth! Supplied as a set of jumbo plugs (2.5 - 3.5cm diameter), from tissue culture, and over-wintered, to plant straight out or into pots, for flowers in first Summer and every Summer after too! Also now available as fully established 2L potted plant. Young plants are best left undisturbed to form clumps; mulch for the first two winters - about 6-8 inches. When picking alstroemeria pluck the flowers rather than cutting as plucking stimulates the rhizome encourage further growth. 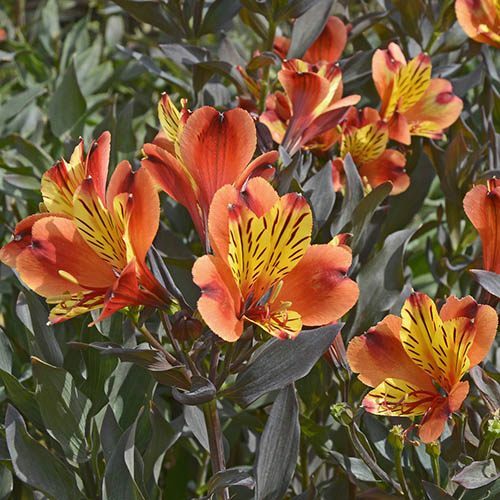 Pot up Alstroemeria plants and grow them on in frost free conditions until large enough to plant outdoors. When all risk of frost has passed, plant Peruvian Lilies in a sunny or semi shaded position, or in patio containers in a soil-based compost (John Innes No.3). Water Indian Summer regularly and feed container grown plants with a general-purpose feed each month. In autumn, cut back old Alstroemeria flower stems and apply a dry mulch of chipped bark or straw to protect the rhizomes. Although Alstroemeria prefers to be left undisturbed, large clumps can be divided in spring.